The world is a very different place in the dystopian post-apocalyptic Chicago that’s depicted in the science-fiction action film “Divergent,” based on the book by Veronica Roth. In “Divergent,” society is divided into five factions based on the personalities of its inhabitants, who are made to declare their selection during a Choosing Ceremony on their 16th birthdays. After that, training begins. For the main character Beatrice, who shows a range of aptitude, this means performing extreme stunts and undergoing extreme training in extreme environments after she selects the group Dauntless. To support the storyline, extreme effects were required, and visual effects house Method Studios, a Deluxe Entertainment Services Group company, took the lead role. The span of VFX work in the film by Method and the other studios included full-CG environments, city plate enhancements, set extensions, digital doubles, CG trains and buildings, monitors, crowds, and muzzle flashes. Method’s crew was led by Visual Effects Supervisor Matt Dessero. Overall, Method completed 381 shots, creating a variety of complex environments, set extensions, digital doubles, and CG characters throughout the Summit Entertainment movie. Jim Berney was the production’s visual effects supervisor, with Greg Baxter producing. Watch the Divergent Trailer here. “Nothing was done over the top. The director and I wanted everything to look as though it was photographed,” says Berney. According to Berney, a lot of the VFX entailed the construction of various locations around Chicago. “We wanted everything to look as though it was captured in camera, but many of the situations, like running along a train on the El, were impossible. So, we always started with some piece, no matter how small, of photography,” he explains. Method sets the stage with enhanced helicopter plates to create a futuristic Chicago, generated with matte paintings and CG buildings. The scene sets the stage for the film and is followed by a number of other scenes showcasing the new cityscape. In fact, Method handled all the city enhancements, in addition to the mirror and train sequences, the wall, and Tris’s fear simulations that occur in the film. The work was done during a eight-month period, with a team of nearly 100 people. 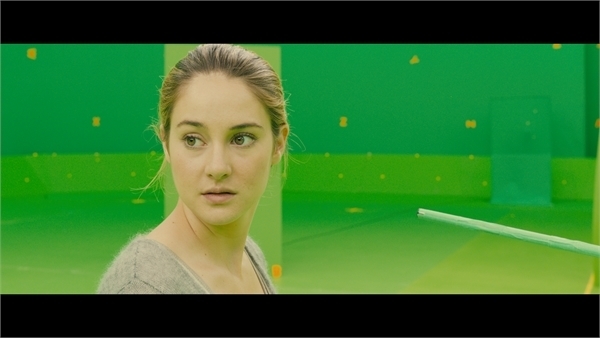 The majority of effects Method completed for “Divergent” can be classified as invisible visual effects work. The effects range from environment work to full-CG character work. The most obvious would be dystopian look of Chicago, 100 years in the future, which is based on Production Designer Andy Nicholson's concepts. 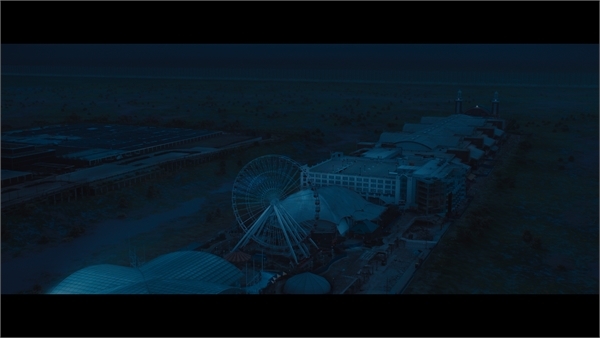 On the character side, digital doubles were created and used throughout the film to add scale to the cityscapes. 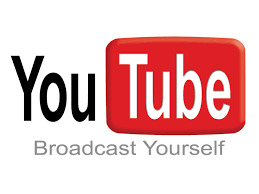 Massive was used for digital crowd extensions to expand the scope of the Dauntless Army attacking the Abnegation neighborhood. “We shot motion capture and built libraries of animation cycles to assist the animators,” says Dessero. As for animals, Method created CG ravens and a CG dog for the film. The bird attack sequence contains upward of 50 digital ravens attacking Tris in any given shot in this sequence. The environment work, meanwhile, ranged from simple matte painting extensions to full-CG environments. Other assets Method built for this film include the El Train track and the futuristic train that runs atop them, plus CG turbines and cables, all seen throughout the movie. One of Method’s largest environment builds was the Dauntless compound exterior, including the glass atrium. Futuristic muzzle flashes and digital knives were built and can be seen in during the training and end-battle sequences. Method also created “simulated environments” that Tris, our heroine, imagined during her testing. 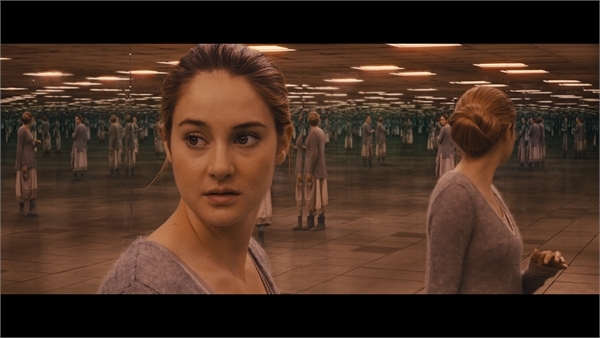 The simulated environments varied from the mirror room with infinite reflections, to wide exterior shots out by the fence where Tris is being attacked by ravens. To accomplish the effects, Method used a range of software, including Autodesk Maya with V-ray, Side Effects’ Houdini and Mantra, The Foundry’s Nuke and Mari, Adobe’s Photoshop, Science-D-Vision’s 3D Equalizer, and Vicon’s Boujou. 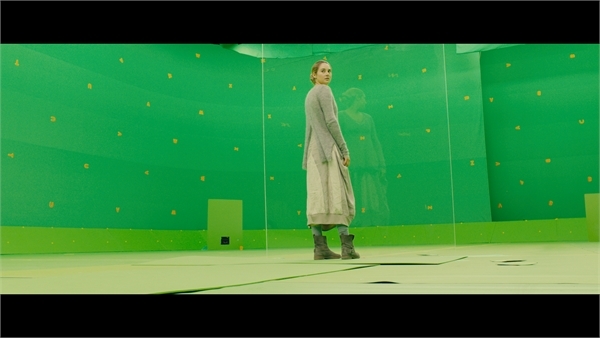 Indeed, “Divergent” required seamless effects work, particularly the scene in the Mirror Room. 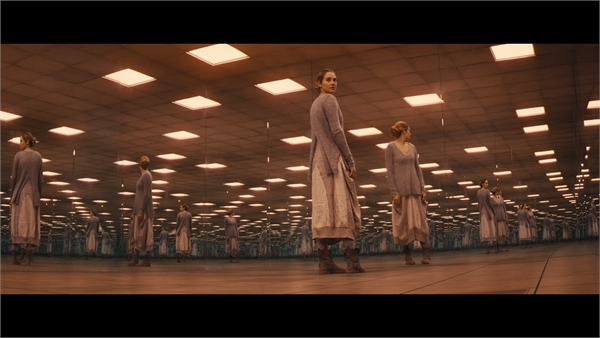 In fact, Berney counts the Mirror Room’s 36 shots among the movie’s more complex scenes, requiring the VFX artists to construct a mirror room environment using photography for Tris (the newly named Beatrice), and CG for the walls, floor, and ceiling. Dessero sets up the action during one of Tris’s sim tests: As Tris wakes up in this imaginary world, she steps toward a mirror wall, but something is not quite right. She looks to the left and a wall that was solid is now floor–to-ceiling mirrored surface; reflections travel deep into the scene. She turns back one more time only to reveal that the entire room is now floor-to-ceiling mirror; her reflections traveling to infinity, thus setting the tone for this scene. Previs was completed by The Third Floor under the direction of Berney, with final techvis by Method Studios. The Mirror Room photorealism was realized by capturing as many “close reflections” as possible on film. To accomplish this, six Alexa cameras were used and mathematically placed for each shot on a greenscreen stage. Back at the shop, the resulting captured imagery was then placed on cards in The Foundry’s Nuke at their respective positions in 3D space. For distant reflections, full-CG rotomation of Tris was required. 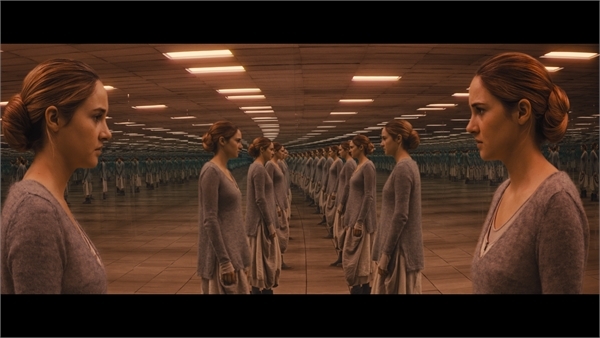 Watch the Divergent Mirror Scene here. “We decided to render the distant Tris reflections as CG. This allowed us to art-direct the lighting, adding distant pools of light and giving more complexity to the lighting design,” says Dessero. On set, there were some serious technical challenges to overcome, and Alwin Kuchler (DOP), Len Levine (gaffer), and Jim Shelton (key grip) were instrumental in helping Berney and Dessero bring the scene to life. The scene culminates with Tris tackling a full-CG dog as she exits the simulation. Prior to filming, the team had to determine how to place the 130-plus cameras needed to capture the shots in the previs. “During techvis, we made sure every technical detail was buttoned up, such as the actress’s height, the camera filmbacks that were to be used on the day of the shoot, stage limitations, and so forth. We defined a common origin for the environment to make the shooting of the scene as easy as possible,” says Dessero. Berney, Dessero, and Fabio Zapata (Method’s supervising data wrangler) spent many nights trying to figure out each shot from a technical perspective. Once each shot was technically established in the computer, they then had to find a way to get all the camera position data and actress’s paths back into the real world. “At Method, our programmers wrote custom code that allowed us to upload positional data for each shot to our Leica robotic survey head. Back on stage, we started by calibrating the head to specific control points on the stage. Once that was calibrated, we then began the process of plotting each position onto the stage floor,” says Dessero. Not only did they plot camera positions, but they also plotted the actress’s paths for each shot. By preparing the stage in this manner, the group was able to get through this complex shoot in less than three days. “It definitely was our most complex sequence,” Dessero says. “This sequence of several dozen shots was challenging both on set and in post, and ultimately very gratifying to see accomplished and one of which we are very proud,” says Dessero. 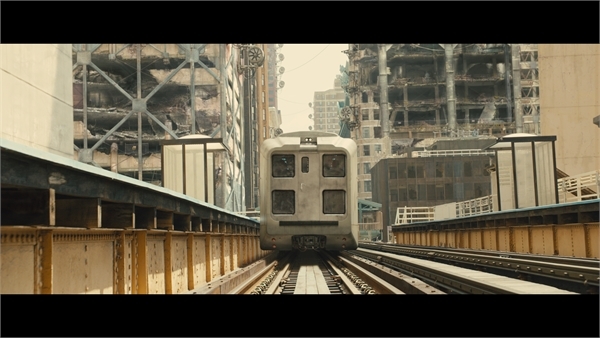 From the opening scene to the final shot in the film, several exterior shots of the “Divergent” world were realized using digital matte paintings in the far background, projected matte paintings in the mid-ground, and full-CG builds in the foreground. In the opening scene, Method created a digital vegetation system. The system allowed the artists to create close-up grass with dew drops in the opening shot, and was also used to replace the flowing blue waterways of Chicago and Lake Michigan with trickles of brown water, swampland, dry grass, and brush. As the camera pushes into Chicago in the opening scene, Method modeled the terrain, river ways, buildings, bridge, and freeway destruction. The destroyed buildings were modeled in Autodesk’s Maya then procedurally collapsed in Side Effects’ Houdini. Thousands of trees and bushes were procedurally placed, and grass and overgrowth were scattered about the city. The goal was to really set the tone for the world we were about to enter, says Dessero. Giant wind turbines that generate power were added to the buildings, and cables were dressed to show that the city’s infrastructure was put together quickly and out of necessity. “In layout, we placed the turbines via an instancing system that was created for quick placement and swapping out of the turbines,” Dessero explains. There were three unique models of the turbines, and each had three texture map variations. The cables were hand placed. Some shots contain over 500 turbines, and hundreds of digital extras were added. For a menacing 130-foot fence that surrounds the city, a 30-foot cement fence was shot on location, to which Method added 100-foot-tall metal towers and guard shacks. Method also created numerous versions of Chicago’s famed elevated train, with CG tracks and futuristic train cars. For the Abnegation neighborhood, the artists built set pieces on location. These set pieces were made to actual scale and included 12 practically built facades. “We shot these scenes with greenscreens at the ends of each row of houses and extended them digitally to make this world feel much larger than what was shot,” says Dessero. Extra digital set dressing in the form of laundry racks with clothes blowing in the wind, stacked logs, ladders, digital people mulling around, and even wind chimes were added to make the area feel more lived-in. Additional grass, overgrowth, staining, and cracks in the building facades were made this neighborhood feel as if it had been there for many years. For one particular action-packed sequence where Tris and others arrive at the Dauntless Compound, Method built a variety of brick buildings, including the roofs and a huge glass atrium, with digital doubles jumping from train cars to rooftops – which augmented the leaps of real stunt people. cracks to the glass and augmented the large plates of exploding cracked glass in the wide shots. During a fear simulation drill, Tris is attacked by a CG flock of birds, created by Method. “We had a number of shots that had between 10 to 50 CG ravens. The sequence is in the simulation of worlds, a dream-like landscape, and the overall feel had to be creepy and frantic,” says Dessero. In most of the shots, the ravens are swarming around Tris, clawing at her in midair, while some land on or near her. This meant the ravens had to have quick enough render times to push 50 per shot, but also hold up quality-wise to be full frame without motion blur, he adds. “When creating the CG blackbirds, the key to realistic shading is in the way the spec travels across the bird. Instead of texture maps for spec and opacity, we went with a full geometric approach,” Dessero explains. “Every feather was rendered in order to get realistic specular highlights. We used a combination of instancing and modifying Houdini’s fur procedural to create every feather at render time. This allowed for a much smaller memory footprint, resulting in faster render times without compromising quality.” The ravens were rendered in Mantra through Houdini. Method also built assets that were shared with other VFX vendors and included digital doubles, turbines, trees, and lake beds. In fact, five other studios worked on the film, as well. Scanline handled the Pit, zip-line, capture-the-flag test, and high-wire test in the four’s fear sequence. Soho did the work on the Choosing Ceremony crowd and environment, and all the monitor work. WormStyle took part in the four’s fear sequence – killing the innocent and the five Marcus, as well as city paint-out and weeding, and various plate fixes. Lola and Cosa also performed work. 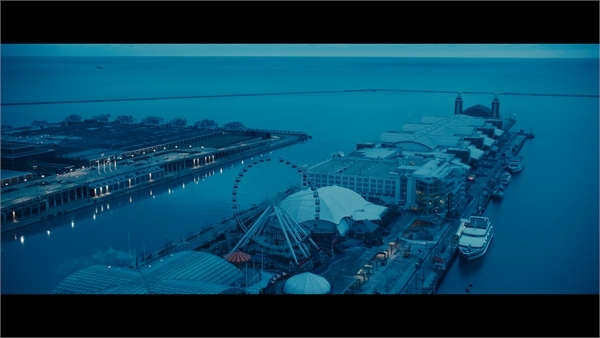 Berney points to the Scanline zip-line scene – whereby the studio constructed a nighttime, futuristic Chicago using helicopter plates and CG buildings to fly Tris through – as a memorable sequence. Another, the four’s fears, was done by Scanline and WormStyle and it involved a full-CG environment and the compositing of multiple plates. In all, there were approximately 1,000 VFX shots divided among the six vendors. Berney says that constant communication and the sharing of resources and assets helped maintain a consistency in the aesthetic. Wet Taylor Lautner New Photoshoot (Rolling Stone maybe?) rawr! Help Support Mandy's Mind: Donations will help Mandy keep doing what she is doing.